Tesla Inc.’s cash-burning days after blazing through another $1 billion last quarter. conference call, Musk was berating analysts for asking “boring” questions, and any shred of predictability was out the window. Investors cringed, sending the stock down as much as 7.4 percent to $279 in early trading Thursday. the hand that feeds, ridiculing representatives of Wall Street’s biggest banks who tried to pinpoint how he’d live up to his promises to build more Model 3 sedans and generate cash in the second half of the year. Prospective patrons have showed patience — there are still more than 450,000 reservation holders waiting, and customer deposits keep rising, approaching almost $1 billion as of March 31. “We’re going to YouTube,” Musk said, referring to the owner of a channel on the video-streaming service who had lobbied the CEO ahead of time for the chance to ask questions on behalf of retail investors. Tesla’s balance sheet also was a sore subject for Musk. 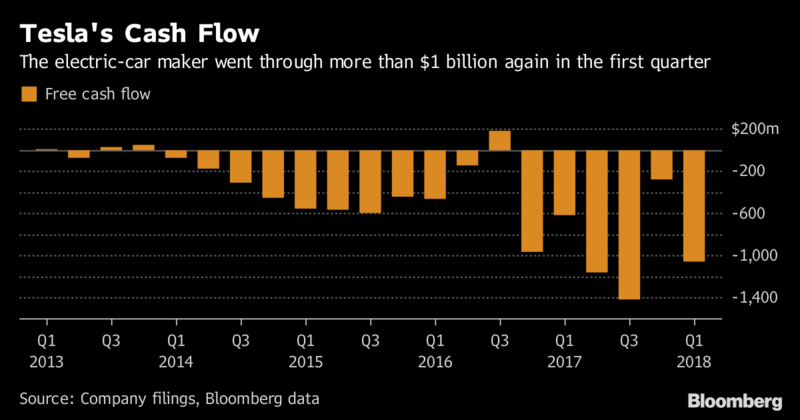 While Tesla expressed confidence about the second half of the year, negative free cash flow was more than $1 billion for the third time in the last four quarters. The result was also worse than analysts’ average estimate for cash burn of about $978 million. 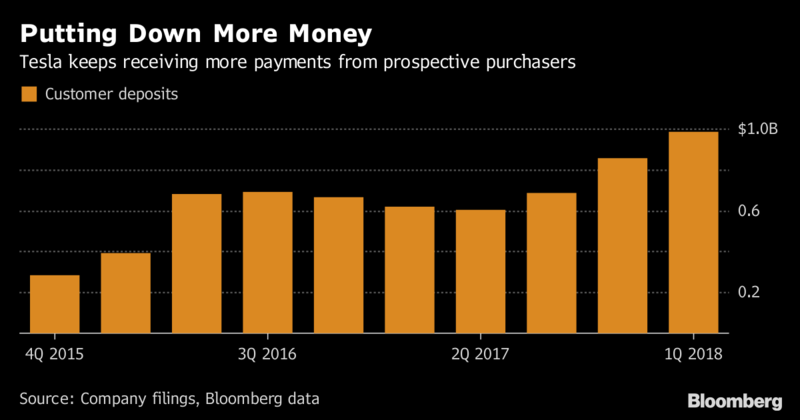 Tesla had $2.67 billion in cash on hand at the end of the first quarter, down from the $3.37 billion at the end of last year. Toni Sacconaghi of Sanford C. Bernstein, who rates the company the equivalent of a hold, bore the brunt of Musk’s sharpest words after asking about capital requirements. automation system from its German manufacturing unit Grohmann.